I received 2 questions on dividend investing and cash flowing for financial independence question and I would try to address them here. These questions were sent to me as part of my organizing Investors Exchange 2018. And while I am not always in the best position to answer, I will try my best where I can. Its even more awkward when the questions are on my friend B‘s The Evolution of Dividend Strategy presentation. 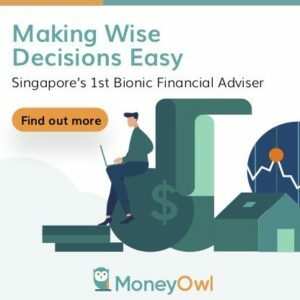 Brian Halim’s strategy is to buy stocks with 6% Dividend and 4% Growth. Over what period is the 4% growth measured? That 4% will be past performance right? 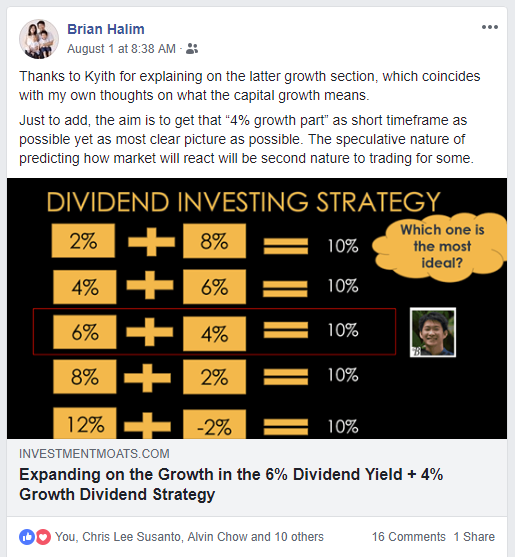 Brian Halim achieves FI when his dividend income matches his expenses. However his portfolio is 100% stocks. During an economic downturn, dividends might be affected. How can we handle that? If we switch to safer assets like bonds, the yield might not be high enough to match expenses. Think during the presentation, B shared with us how he frames and pigeon hole the companies that gives out a dividend into any of these 5 segments. And then he shares their characteristics and one example on them. The one he prefers the most is the 6% dividend and 4% growth strategy. The growth in this case can refer to many things but in my opinion it has to be capital growth. This means that the net asset value of the business grows at roughly 3-5% per year. When the net asset value grow, usually the share price will follow. (If it doesn’t then perhaps that stock is undervalue). The other way is that the share price, or market capitalization grows at an average of 3-5% per year. This is almost the same as my previous net asset value explanation. It just skips the net asset value, in that the market accords the stock to trade at a consistent 6% dividend yield. If you look under my Dividend Stock Tracker, you can find that there are many stocks/REITs that currently gives a dividend of 5.5%-6.5%. Let’s take the example of Ascendas REIT. It is a real estate investment trust, the biggest in Singapore that owns a lot of industrial properties in Singapore, Australia and now UK. Its share price is $2.75 and the last dividend per share is $0.162. So this gives it a dividend yield of $0.162/$2.75 = 5.89%. So suppose that you hold Ascendas share today at $2.75. Come next year, Ascendas business did well and they were able to bump the dividends up by 10%. So the dividend per share for next year is $0.162 x 1.1 = $0.1782. Your yield on cost would be $0.1782/$2.75 = 6.48%. That is a pretty good dividend yield for a quality portfolio, big sponsor and quality management team! However, the price usually won’t stay at $2.75, if the dividend is able to improve by 10%. The market participants will buy and sell, buy and sell and eventually the prevailing share price will make Ascendas REIT trade at 6% dividend yield again. Since the dividend per share now is $0.1782 and to make Ascendas REIT trade at 6% again, the share price would need to be $0.1782/0.06 = $2.97. So how much did the share price change? ($2.97-$2.75)/$2.75 = 0.08 or 8%. So you get a 5.9% dividend yield and a 8% capital growth. Is Ascendas REIT always going to trade at 6%? We can tell this if we track Ascendas REIT’s historical dividend yield. 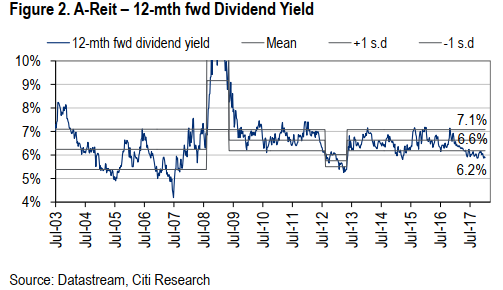 The above forward dividend yield graph is taken from a CITI analyst report. We observe that over its 15 year history, there are times when the mean is closer to 6.2%, sometimes 6.6%. The market does not always value Ascendas REIT on the spot, but would gravitate back and forth to it. So this is how growth or deceleration happens. The gyration of dividend per share and the share price. 2 items that are affected by business fundamentals (dpu) and market forces (share price). Is the Growth Past Performance? The answer here is no. It should be forward looking and into the future. This is because why would we be investing in the past? We should be investing in the future. Thus B’s 4% is based on his analysis of this particular business, how its growth trajectory is likely to be in the future. To find its future growth, we have to look at the past performance to understand its nature. You have to look at the market in general going forward and mesh the past and market together. In Ascendas case, real estate goes through period of boom and bust, and because the properties are in different geographical regions, we have to see the near term or far future of 3 different markets (Singapore, Australia and UK). If we want to position for 4% growth, these markets, their production manufacturing, should be good. Otherwise why would we put money in an investment where in the past it shows that it grows 4%/yr but in the future the growth is -2%/yr? 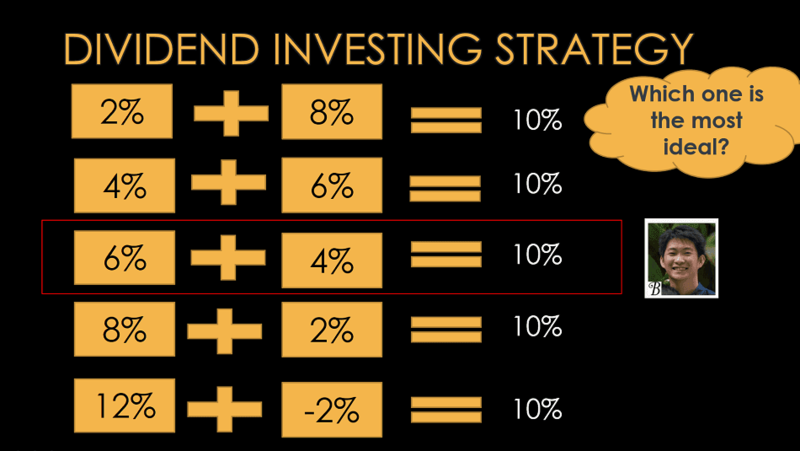 Probably what was lost in the translation while I was typing this reply out is that each of these 5 dividend strategies allow you a quick and dirty way to pigeon hole the likely return of the company in the near term. The idea is that, you do not know what kind of total return you are going to get. You pair a sustainable, recurring dividend, with the appropriate near term growth rate. If you can approximate the revenue, the margins and the cash flow, you can see the bump up. Thus it lets you see whether the stock is priced reasonably for the risk and for speculation. Ok this concludes my answer to the first part. Got to get to work. Let me know if you have any queries.